The perfect slim-fit jean that’s not too skinny or tight but still gives you that close-cut look. Impossible, right? Wrong. 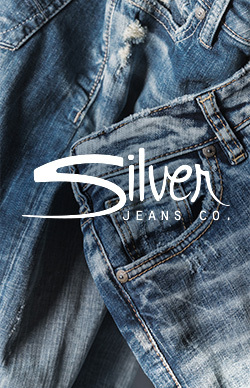 Here at Silver Jeans Co., we’ve made it our mission to design a jean for every type of guy. With a slim fit through the hip and thigh, Taavi and Konrad give you the modern, streamlined look you’ve been searching for in a pair of jeans. Now, all you have to do is choose the one that’s right for you. The slimmest jean in our men’s denim collection, Taavi has a slim hip and thigh and super-slim leg. It’s designed specifically for the guy who wants a close-cut look that’s not too formfitting. Plus, it’s crafted in high-quality denim with varying levels of stretch, so you can get the look you want without sacrificing comfort. For the same slim fit with a slightly roomier leg, try Konrad. Konrad gives you a tailored, streamlined look from hip to ankle that’s easy to wear and extremely versatile. And the choices don’t stop at fit—we have a wide range of washes and distressed details to help you find that perfect jean. Whether it’s a faded indigo wash with a rugged, vintage-inspired look or sleek, clean color that makes a crisp, classic statement, there’s a slim-fit pair for every style and occasion.